Hi crew: The JR is capable of staying in one place for an extended period of time so that it can core into the seafloor. Besides the 2 main screws at the stern of the vessel for moving forward, there are 5 thruster pods, each with 2 propellers, located around the perimeter of the ship. These thrusters are lowered when we arrive on station. Because we core in great water depths and sometimes to great depths into the seafloor, the JR carries a lot of hollow, steel drill pipe. I’ll explain why the pipe is hollow later. The pipe comes in 30 ft. lengths, but 3 lengths are nearly always kept together to create a “stand” of pipe ~90 ft., or nearly 30 m long. 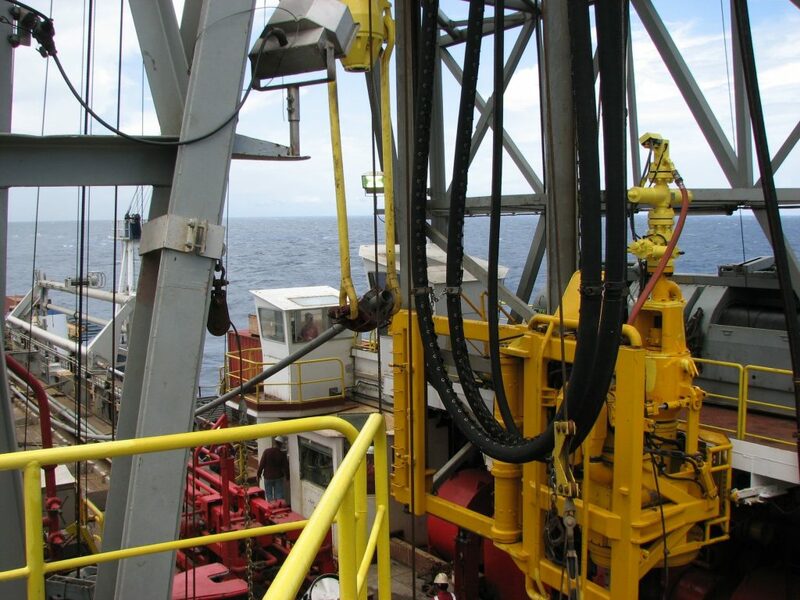 The pipe is stored horizontally in racks aft of the drill rig and drill floor. The pipe racker automatically “feeds” pipe into service when making up a drill string (the opposite occurs when the drill string has to be disassembled and racked again).